The air ducts in your Lebanon – Wilson County, Tennessee home are probably low on the list of things you spend time thinking about. But neglected air duct maintenance can cause problems with mold and other airborne elements which could lead to allergies. Air duct cleaning by an experienced contractor like Bentley’s Air Conditioning reduces excessive airborne dust and particles, unclogs restricted air ducts and registers, and removes impacted material from blower fans and air conditioning coils. In the process, unhealthy mold, mildew, and bacteria is safely removed. You and your family will be breathing fresher, cleaner, healthier air. Clean air ducts in your home will result in lower energy bills by allowing your heating and air conditioning system to run more smoothly and efficiently. If you answer “Yes” to any of the following questions, it may be a good idea to have your air duct system examined and decontaminated. Have you noticed a buildup of dust lately? Is your ceiling discolored around the air conditioning vents? Have you seen an increase in your energy bills? Does anyone in your home have breathing problems, allergies, or respiratory illnesses? 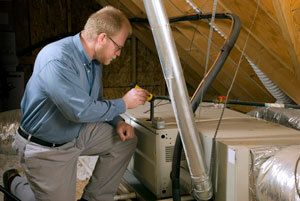 Bentley’s indoor air quality experts have the solution: A whole house air duct cleaning. Your system will be tested to identify any operational problems. Your entire air duct system will be cleaned and deodorized. All of your vent registers will be removed, thoroughly cleaned and re-installed. Your system will be re-tested for proper operation. Contact us to schedule a free indoor air analysis of your Lebanon, Tennessee area home. Fresher, healthier indoor air is a just phone call away at (615) 444-1452. © 2019 Bentley’s Air Conditioning.